I have not had to pay for accommodation in over a month and food has been provided for me along the way on several occasions. 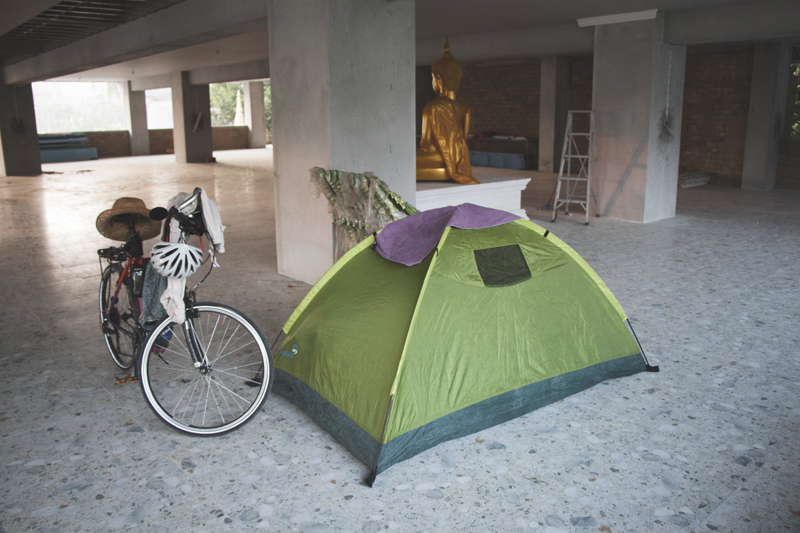 Whether it be friendly and generous Couchsurfing or Warmshowers hosts, friends met during or before the trip or people at private houses, police and gas stations or temples where I have clumsily asked permission to pitch my tent, the response has always been overwhelmingly positive. I am just blown away by the generosity of everyone that has crossed my path so far. Although I know this isn’t the reason why they are doing it, I cannot wait for the day I can pay it forward when I am in a situation to do so. He stopped me by the road side to give me two packs of cookies and a bottle of juice! 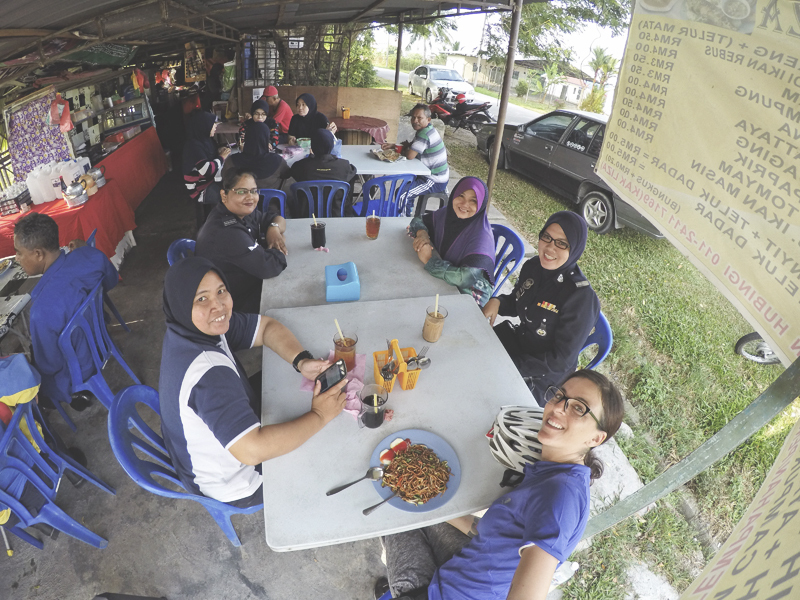 These policewomen invited me for breakfast because they wanted to hear my story. Feeling safe sleeping with the Buddha. 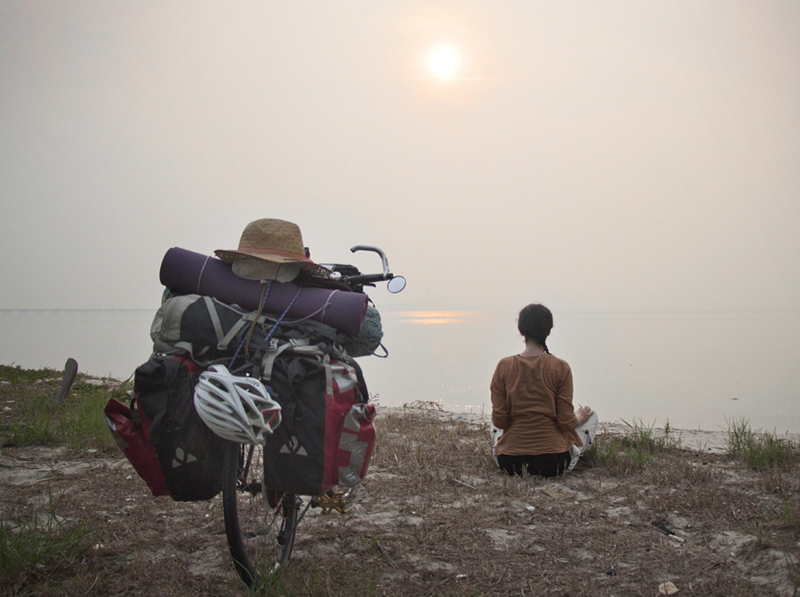 I feel that by cycling around I am discovering the true South East Asia I was dreaming of before I came here to backpack. 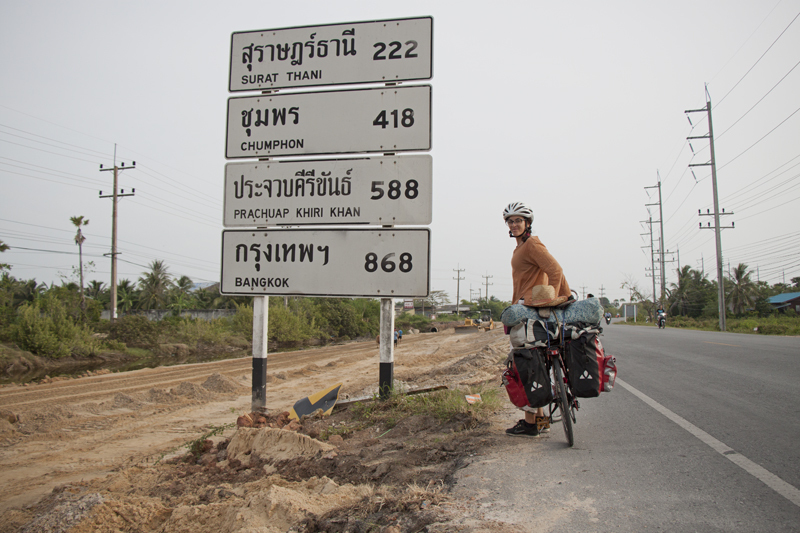 Crossing little villages where few Westerners have been means meeting a lot of curious locals. 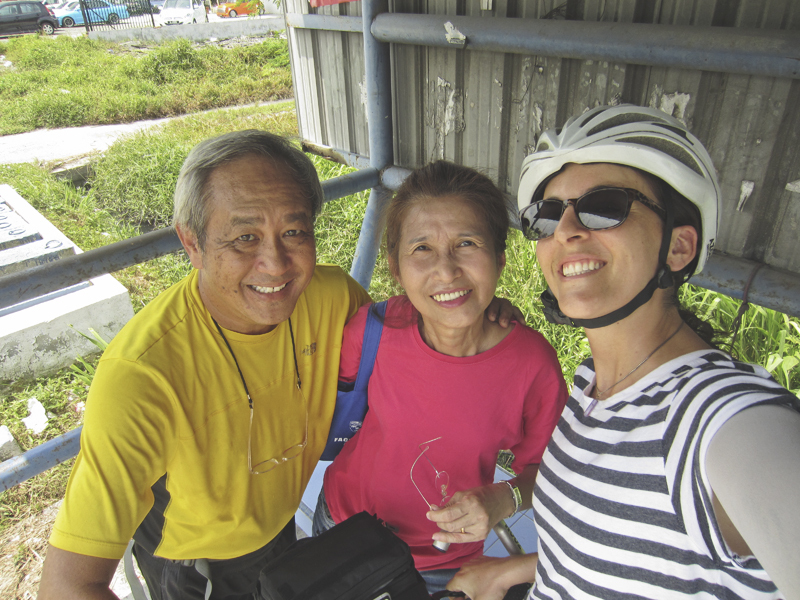 Friendly smiles and waves, people stopping me to ask questions because they are genuinely interested and not because they want to sell me something, cheap and authentic food – with people inviting me over to sample it – are all part of my daily life. I feel privileged to get to see this side of South East Asia that few people get to experience and it is truly magical. There is not a chance in the world I will ever work in a cubicle full time again. What’s this crap about?! Real life is outside and I’m a jungle woman. Period. Preparing this trip has taught me patience, something I haven’t always had. Learning patience is learning to be content with the present moment, accepting sudden changes of plans and letting go of expectations. An invaluable lesson indeed. Hey I was waiting for that! For TWO MONTHS. It’s the best way to travel! 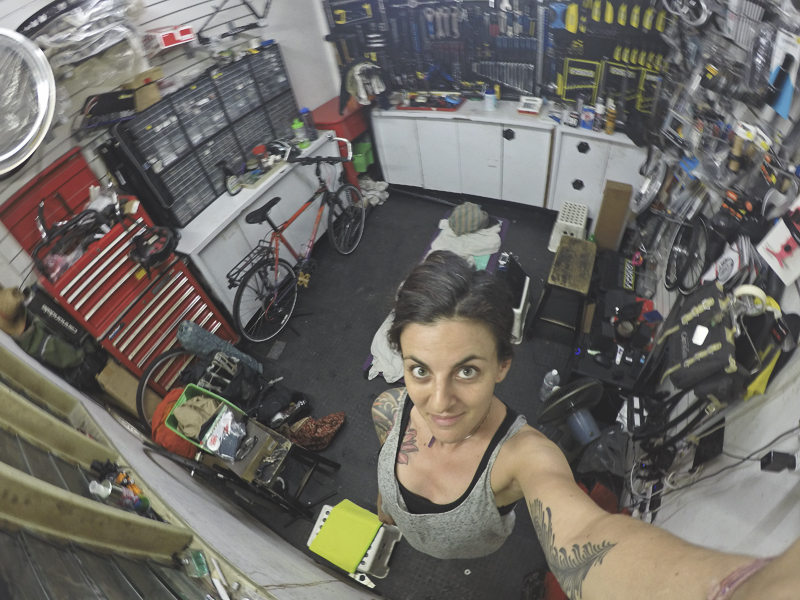 I have had to learn a few tricks of the trade in case I run into mechanical troubles, and I know there will come a point where I will be stuck and will have to learn for myself, which is really the best way to learn. Self-sufficiency, especially as a woman, is an extremely empowering thing. Having other women feeling empowered by what I am doing is equally very moving. Be it online communities or other cyclists met along the way who have provided me with advice, shelter, food, free bike parts or just a good chat, I am happy and proud to be a part of such a great group of people. 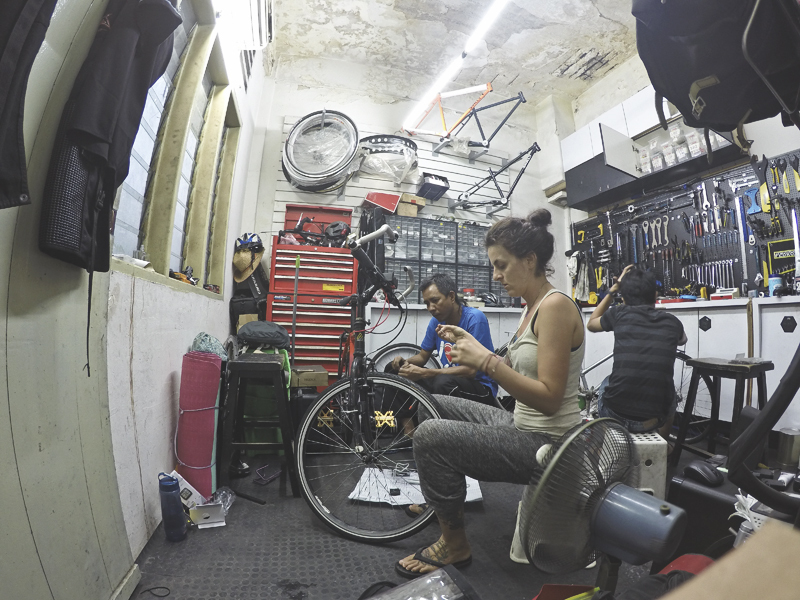 Squatting at The Basikal Bike Shop in downtown Kuala Lumpur… Thanks Akmal! Just do it and the rest will follow. Everything has felt right since this crazy plan started sprouting in my mind: things falling into place on their own, wonderful encounters, even professional engagements along the way. I feel like I am doing what I am meant to do right now, and I am feeling so happy and free. Before this trip, I was a health freak with way too much control over everything I ate. It was all about the superfood and everything had to be organic and wholesome. The only thing I had no control over was all the stress that I had inflicted on myself with a manic pace of life, juggling a uni­ver­sity degree as a mature stu­dent with two demand­ing jobs and an intense half marathon train­ing. I was stuck in this vicious circle that’s so common throughout the western world, and it was making me miserable. I was trying to lead a healthy lifestyle by having complete control of my diet and exercising, but so long as I was holding on to the stress I was never going to reach optimum health. Now, I have admittedly been eating a lot of junk so far on the trip (namely 7 Eleven instant noodles…), but I am feeling at peace, balanced and free from stress. Being able to let go is actually a great feeling. And I bought a bag of chia seeds. Baby steps. Life is a work in progress. You have made this journey so amazing for me with your big hearts and funny English and wonderful smiles and beautiful land. I will be leaving a bit of my heart behind when I go next month, that’s for sure. This entry was posted in Asia, Healthy Living, Malaysia, Thailand on September 30, 2015 by Amélie. This is AWESOME Amelie! Cannot wait to read more. Fascinating and inspiring Amelie. Very good video style. Your experience comes over as very honest and unedited. I really like it. All strength to you to make this a great trip! Lovely to see people treating you so well. Just as it should be! Wonderful once again Amélie! Great thoughts and lovely video, could have watched it for an hour straight! Not so positive (although very enjoyable) but honest and with ups and down, how real life can go 🙂 hope you learned plenty and take care! 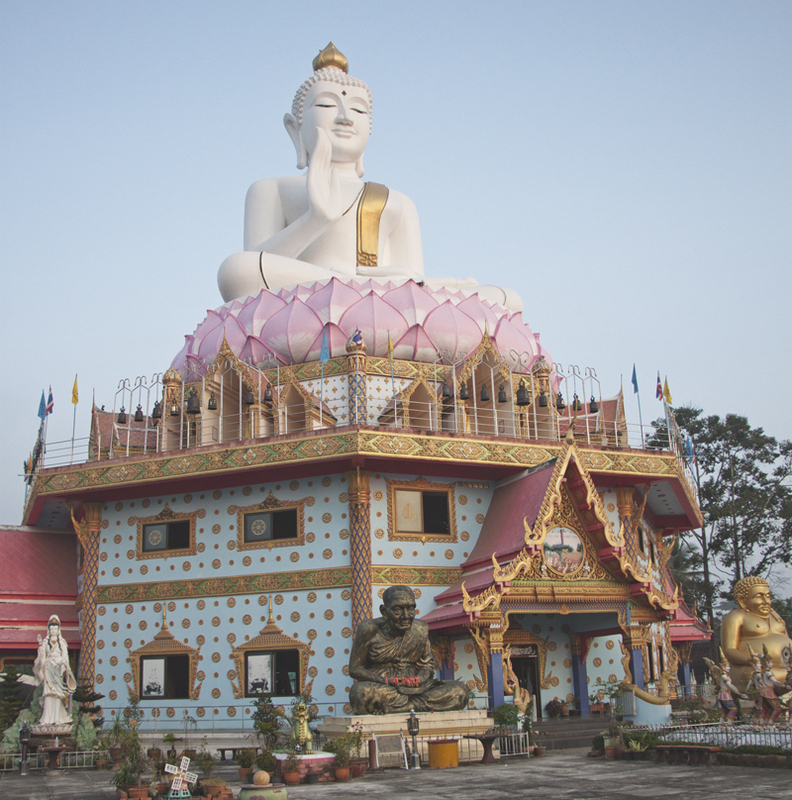 Je viens de découvrir ton blog grâce à ton commentaire sur le groupe facebook de TBEX Bangkok… Et une chose est sûre, j’ai hâte de t’y rencontrer ! You are amazing and loved the line, I’m a jun­gle woman. It was never going to be easy but always a memorable experience. I also freakin love Thai and Malay people. what an amazing trip! 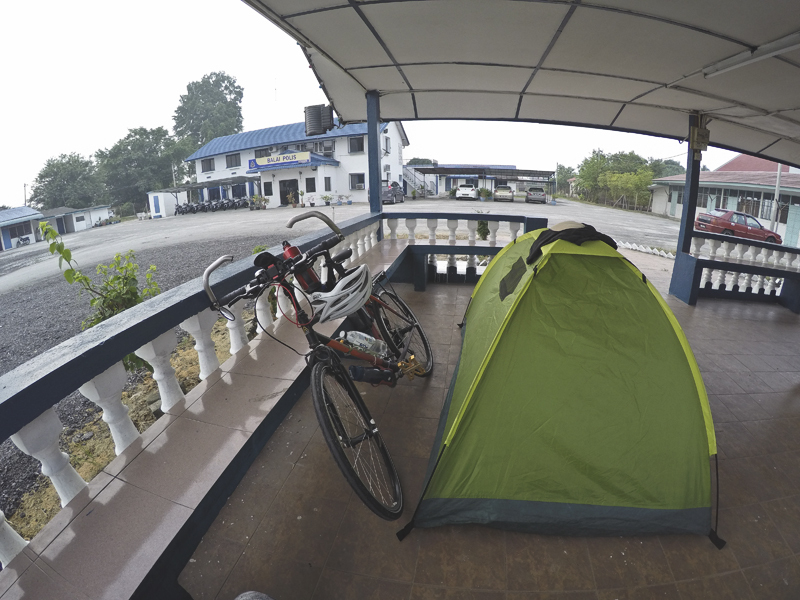 I love malaysian people too, but I don’t think I’d manage the cycling and camping! You’re so cool for doing this! I love to be outside and we recently went on our first bike tour, however it was just a small loop in Holland … craving for more though. Good luck with your next 1.000 km! This is so inspiring! The kindness of strangers is something you begin to appreciate once you’re out of your comfort zone and this is such an important lesson to realize that the world is an amazing place. Wow! 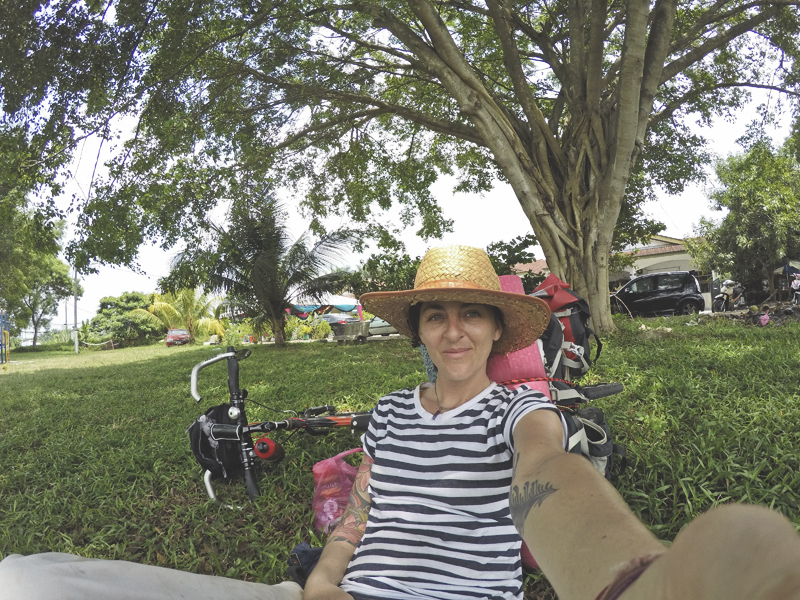 You’re incredible to be traveling solo by bike. You must feel so free! Oh shush! 🙂 Yeah, it feels amazing! What a great journey you are on. Travelling restored my faith in humanity too. 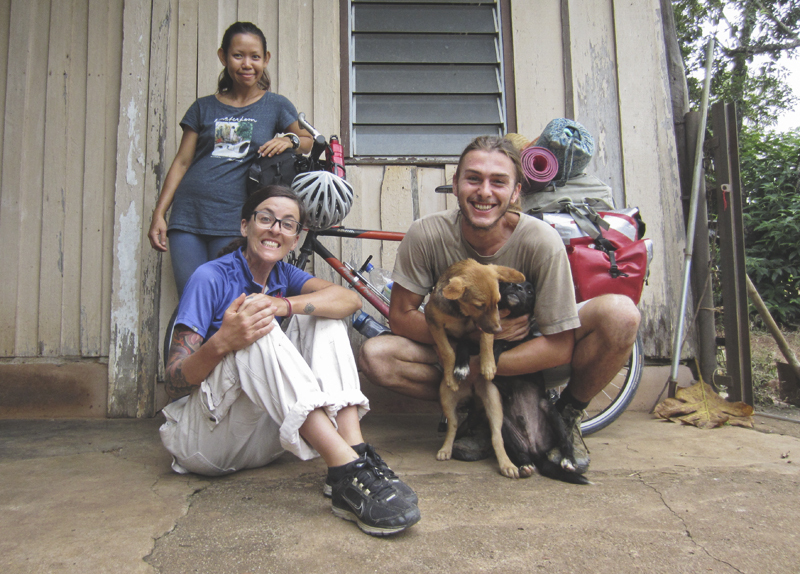 I lost count of the amount of times I was shown generosity by complete strangers over the past four years I have been travelling. It’s so good you meet so many hospitable, generous and kind people on your way! Thanks you Monica, yeah, people have been incredible to me. I can’t wait to be in a position to reciprocate this. This is exciting to see. I love how raw, and completely unfiltered your video is. It’s like being there almost, and I can feel the emotion coming through my laptop screen. Absolutely amazing. It’s great that this is your first bicycle tour as well. I’m about to go on my first tour, and it’s nice to see how other people are getting along on their first one. It’s wonderful, and inspiring, and just makes me want to go that much more. 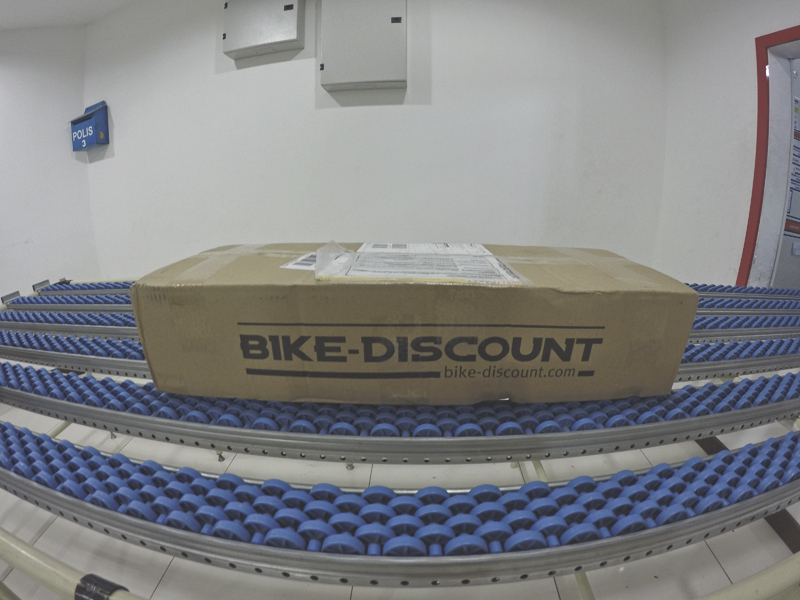 Honestly, I wish I could just jump on my bike right now and leave, but alas….. I look forward to the next 1000km, and more of your adventures! Hi…. Just a note about the 7-eleven noodles. 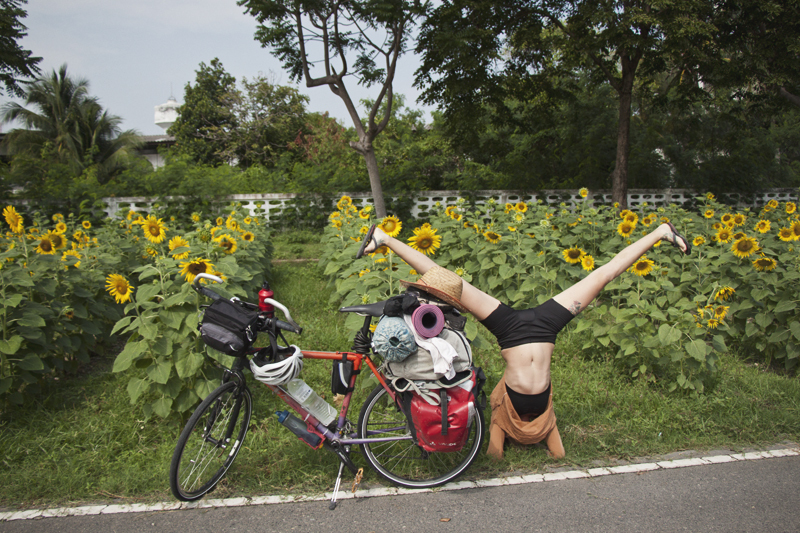 Had to do the same thing on a recent cycle trip around Taiwan. Yup! Just let it go. It’s all good….You made me laugh!!! Take care and travel well!!! Cheers!!! I have a very specific question for you. I follow many travellers and I’m always struck by the stories of the kindness of strangers, namely with them offering travellers food. I noticed you’re vegan, and I wondered, how have you handled this in terms of refusing non-vegan food without wanting to be rude?